Mas Alla del Manana, El. Organo del Centro "Amor, Paz y Caridad". Aguilas, Murcia, Spain. Language: Spanish. Editor: Juan Antonio Romero, founder ("En la vida Espiritual"); Andres Fuster, ed. 1/1, January 1936. 4 pp., 0.15 pesetas a year in Aguilas, 0.20 in the rest of Spain, and 0.25 elsewhere. This was the organ of the spiritist center "Amor, Paz y Caridad," in Aguilas, and is distinguished from the usual run of such journals by its religious tone and by the direct involvement of the spirits. 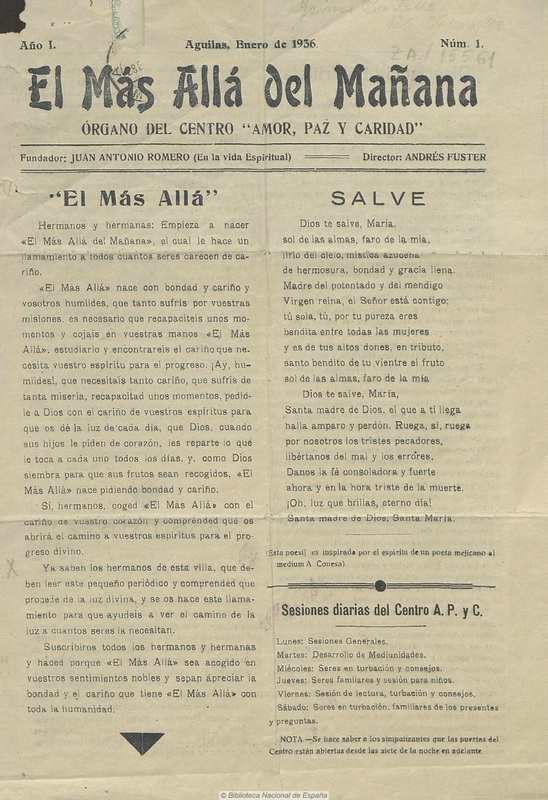 The masthead bears the name of the founder and adds "el la vida espiritual," and much of the content of the single surviving appears under the name of "Un Espiritu que desea nuestro progreso." BNE.